One of the goals of the EFMC is to enhance interactions at the industry/academia interface and to promote improved cooperation between the pharmaceutical industry and academia. 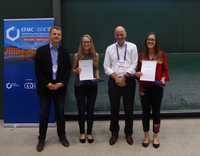 EFMC and F. Hoffman-La Roche therefore proposed an opportunity to broaden the awareness to European University based chemistry students of the EFMC activities by rewarding excellence accomplished during a medicinal chemistry internship in industry. EFMC would like to thank F. Hoffman-La Roche for their contribution and support. The recipients were Miroslav Kosar (University of Edinburgh, UK) and Michael Bogdos (University of Strathclyde, UK). We would like to congratulate both of them for their fantastic achievement. The recipients were Eleen Laul (University of Edinburgh, UK) and Xinlan Aloise Cook (University of York, UK). We would like to congratulate both of them for their fantastic achievement.